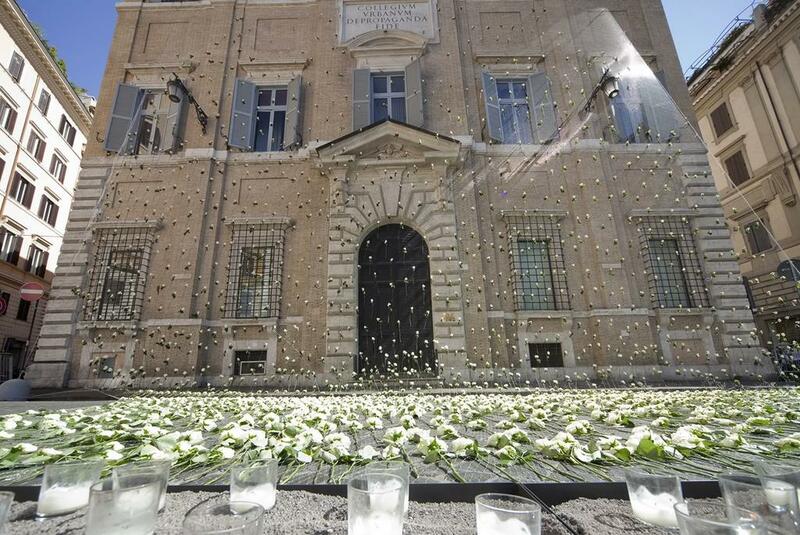 Materials: Façade by Bernini: rnylon nets, white roses, metal tanks, sand, candles. Re Magi Chapel: clay, methacrylate tubes, flowers: zantedeschia (lily) and white rose, candles, glass panels, sound, perfumed essences. Re Magi Chapel: m 15 X 9. Extraordinary among men, devoted to holiness: Pope John Paul II; a palace of catalyzing architecture: the College of the Propagation of the Faith opening on Piazza di Spagna; a chapel consecrated to the belief in the Birth at Bethlehem: the Re Magi Chapel inside of the same palace; an imposing and pompous piazza: Piazza di Spagna in Rome. The beginning of an artistic challenge won by Maria Dompè with creativity and respect for the spiritual and historical prerogatives. Two “incursions in space” for one work, an exclusive gift to Pope John Paul on the occasion of his beatification. 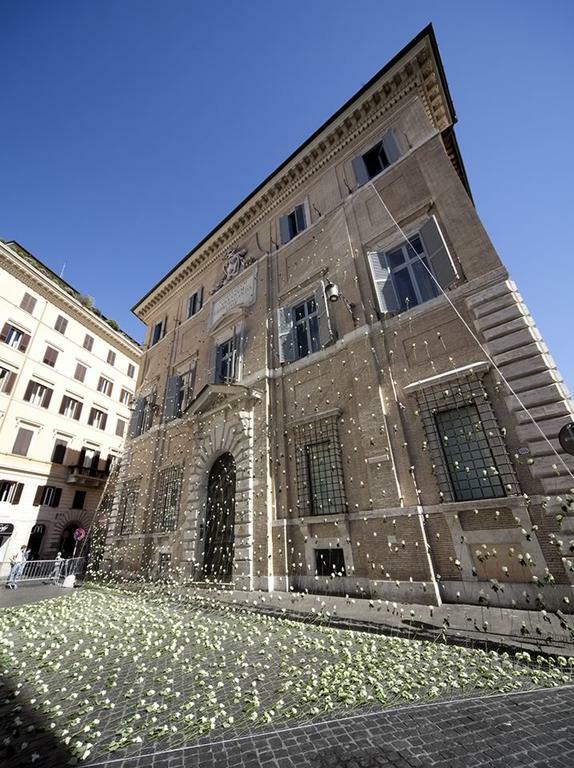 First incursion: façade by Bernini, College of the Propagation of the Faith. 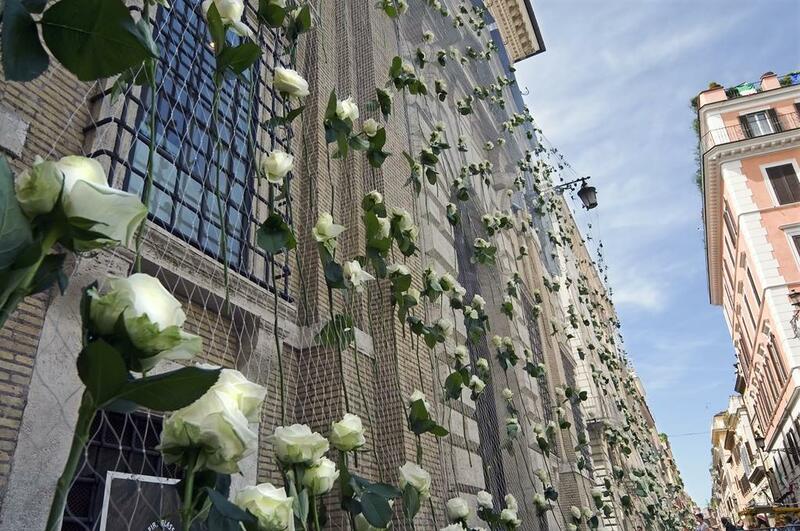 A coat of white roses positioned on architecture of historic importance. 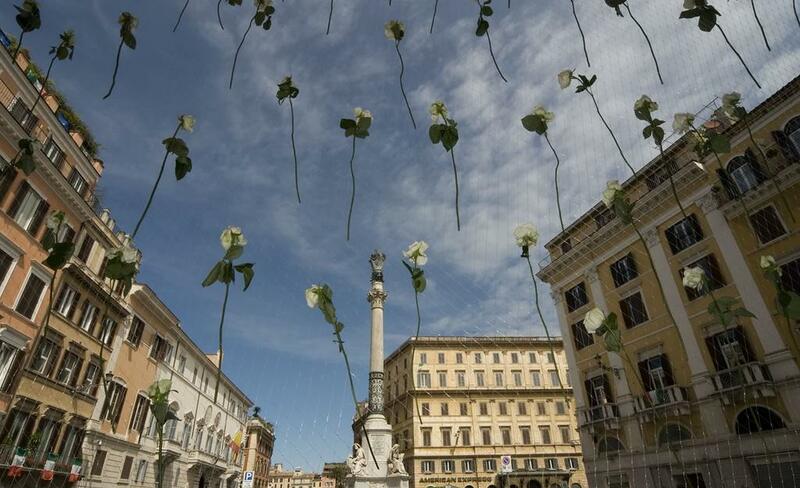 A floral tribute exhibited knowingly on an incredibly light structure of nylon netting. About three-thousand roses concentrated principally on the road, fading into a celestial union with the divine. A metaphor of an illuminated earthly life, elevated into sainthood. The roses rise up in the dimensions and fragrance with solemn progression towards spiritual evolution, like messengers of a preordained vocation. 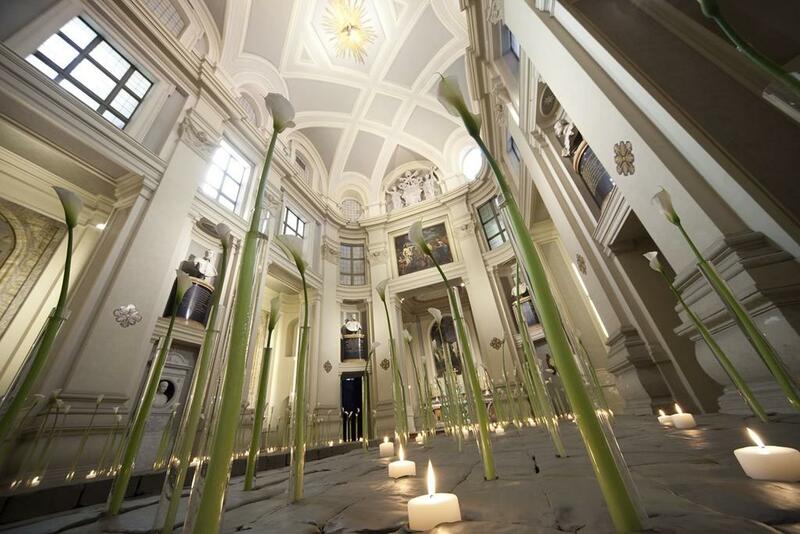 Second incursion: Chapel of the Re Magi by Borromini, inside of the College of the Propagation of the Faith. 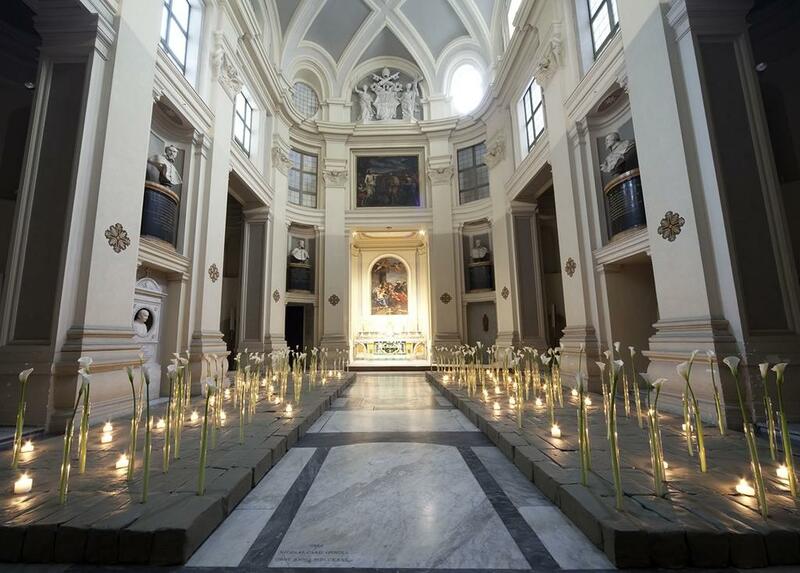 A passage from the airy emptiness of floral image, symbolizing the earth, traced with a clay material covering, placed on the pavement from which emerge tubes of light, illuminated by the transparent reflection of some votive candles. Flames of silent devotion, joined with the explicit expressive power of the lily, elegant witness to faith. 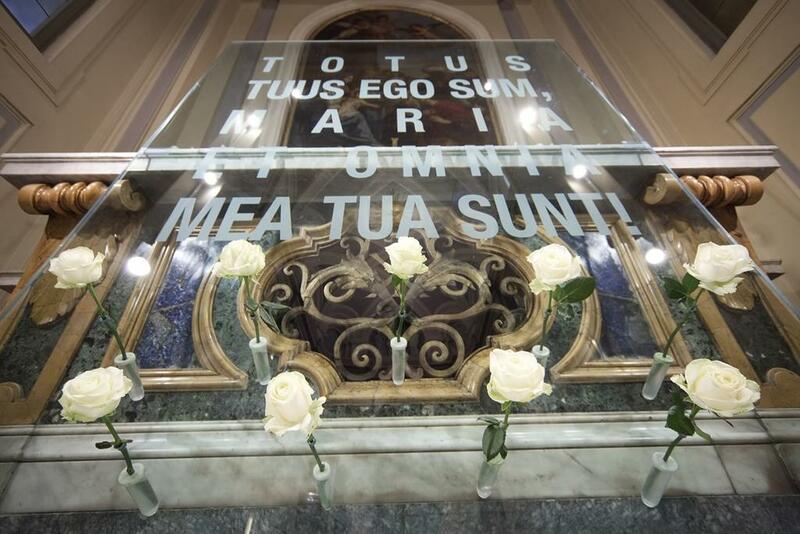 A glass panel of meditated evanescence, contains a quote of Pope John Paul II of inspired devotion to the Madonna: “TOTUS TUUS EGO SUM, MARIA ET OMNIA MEA TUA SUNT!” Glass placed with delicate sensibility on the main altar of the chapel, without covering but exalting it, together with a pale understatement of white roses. A ascetic mystical vision of intense emotional impact. A compelling composition of poetry of the image, of music for the soul and perfume for the spirit. Utopia of art: to investigate with impalpable traces and extraordinary lightness the divine mysteries.